Thousands of lawyers have stormed the streets of Abuja, in protest of the alleged continued disobedience of court orders by the Department of State Service (DSS). 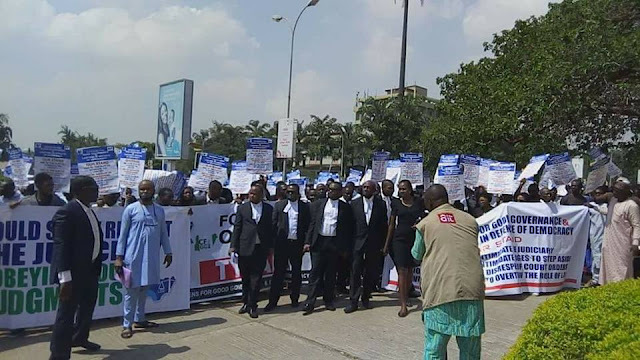 The lawyers, supported by members of the civil society community, have stormed the Federal High Court Headquarters in Maitama, the Attorney General’s office, National Human Rights Commission. They are currently heading to the Three Arms Zone, which hosts the Aso Rock presidential villa, Supreme Court and the National Assembly, a witness said. The lawyers say judges must not step down from cases involving the DSS as that would amount to victory for tyranny and intimidation. 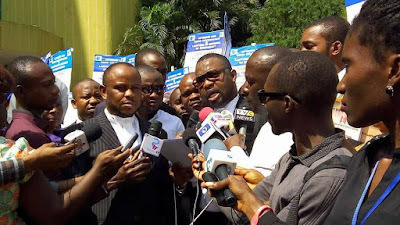 They are also demanding that all judiciary workers to go on strike until the DSS obeys all pending judgments. “Currently, major roads have been barricaded and there is palpable tension as the protesters meet heavy resistance from security agents who are blocking the protesters who are insisting on marching into Aso Rock,” a witness told PREMIUM TIMES. The standoff is happening on the Road leading to the Three Arms Zone. The DSS has been accused of disobeying several court orders since 2015. The most notable cases involve the former National Security Adviser, Sambo Dasuki, and the leader of the pro-Biafra group, Nnamdi Kanu. Some judges have recently stood down from cases involving the SSS, following the arrest seven senior judges on allegation of corruption.